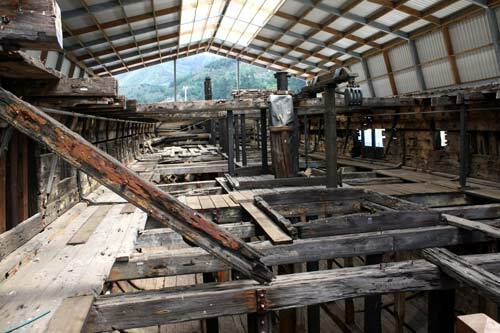 The hulk of the 19th-century vessel the Edwin Fox is the heart of Picton’s Edwin Fox Maritime Museum. This picture shows the steerage level of the formerly fully rigged sailing ship, which was built in India in 1853 and brought immigrants to New Zealand on four voyages in the 1870s. Moored at Picton from 1897 and used as accommodation and then for coal storage, the vessel was partially restored after 1986 and opened to the public.